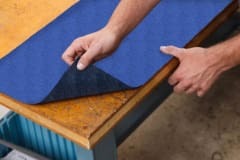 Brady Corporation's new ToughSorb semi-permanent adhesive mats are a great solution to contain spills and prevent them from spreading over the workfloor before they can cause accidents and create liabilities. Uncontained or unabsorbed spills can quickly cause slips and falls on the production unit workfloor. To reduce the risk of slipping and falling, ToughSorb can easily be laid out as a walkway that can absorb up to 25% more liquids than competing products because it is made out of needle-punched polypropylene. ToughSorb helps companies comply with the European Union Water Framework Directive 2000/60/EC about the protection of coastal, ground and surface water. Because ToughSorb can absorb spills it can prevent the contamination of ground water supplies or surface water and help companies avoid fines under 'the polluter pays principle'. ToughSorb can also help comply with ISO 14001 appendix 1, A.4.7, about emergency preparedness and response. Simply roll out the mat, cut it to size and apply ToughSorb on the workfloor using its self-adhesive backing. ToughSorb can be used in high traffic areas, aisles and walkways, in production areas and on workbenches and everywhere traditional rugs would be used, for example to line exits and entrances. While absorbing drips, spills and leaks, ToughSorb's deep, blue colour can also turn frequently used areas into more aesthetically pleasing surfaces. If needed, ToughSorb can easily be removed.